KOREA/FRANCE: LG partners with Paris-based eyewear designer for premium 3D glasses | What Hi-Fi? To be launched at CES 2011 in January, the new glasses have been developed in association with Paris-based eyewear manufacturer Alain Mikli, and are said to offer greatly improved design, fit and comfort. Rather than the plastic of current 3D glasses, the new models use metal, and have optimised balance 65:35 front to back, a new nose-pad co-patented by the two companies to give a better fit, and longer, spring-hinged arms to hold them more securely in place. They're claimed greatly to reduce viewer fatigue, with LG saying that 'of all the challenges facing 3D technology acceptance, the glasses always rank near the top. 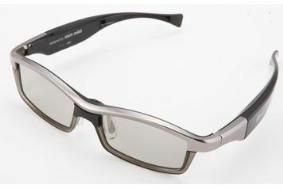 Following their CES roll-out, the new glasses will be made available with LG's 2011 range of premium 3D TVs.